Adhesive capsulitis (AC), often referred to as frozen shoulder is characterized by initially painful and later progressively restricted active and passive glenohumeral joint range of motion with spontaneous complete or near complete recovery over varied period of time. For research purposes the condition is frequently defined as loss of more than 25% of normal shoulder range of motion in at least two directions, particularly abduction and external rotation. AC is associated with synovitis and capsular contracture of the shoulder joint. In clinical practice it can be very challenging to differentiate early stage of AC from other shoulder pathologies. Nevertheless, it is important for clinicians to be able to develop an early suspicion of this condition to benefit their patients. Physiotherapy management of patients with AC may vary in important ways from management of patients with other shoulder conditions. Although the etiology remains unclear, adhesive capsulitis can be classified as primary or secondary. Frozen shoulder is considered primary if the onset is idiopathic while secondary results from a known cause or surgical event. Three subcategories of secondary frozen shoulder include systemic (diabetes mellitus and other metabolic conditions), extrinsic (cardiopulmonary disease, cervical disc, CVA, humerus fractures, Parkinson’s disease), and intrinsic factors (rotator cuff pathologies, biceps tendinopathy, calcific tendinopathy, AC joint arthritis). Adhesive capsulitis is often more prevalent in women, individuals 40-65 years old, and in the diabetic population, with an occurrence rate of approximately 2-5% in the general population,  and 10-20% of the diabetic population. If an individual has adhesive capsulitis they have a 5-34% chance of having it in the contralateral shoulder at some point. Simultaneous bilateral involvement has been found to occur in approximately 14% of cases. Other associated risk factors include: trauma, prolonged immobilisation, thyroid disease, stroke, myocardial infarcts, and presence of autoimmune disease. The disease process affects the anteriosuperior joint capsule, axillary recess, and the coracohumeral ligament. It has been shown through arthroscopy that patients tend to have a small joint with loss of the axillary fold, tight anterior capsule and mild or moderate synovitis but no actual adhesions. Contracture of the rotator cuff interval has also been seen in adhesive capsulitis patients, and greatly contributes to the decreased range of motion seen in this population. There is continued disagreement about whether the underlying pathology is an inflammatory condition, fibrosing condition, or an algoneurodystrophic process. Evidence suggests there is synovial inflammation followed by capsular fibrosis, in which type I and III collagen is laid down with subsequent tissue contraction. Elevated levels of serum cytokines have been noted and facilitate tissue repair and remodeling during inflammatory processes. In primary and some secondary cases of adhesive capsulitis cytokines have shown to be involved in the cellular mechanism that leads to sustained inflammation and fibrosis. It is proposed that there is an imbalance between aggressive fibrosis and a loss of normal collagenous remodeling, which can lead to stiffening of the capsule and ligamentous structures. Patients presenting with adhesive capsulitis will often report an insidious onset with a progressive increase in pain, and gradual decrease in active and passive range of motion. Patients frequently have difficulty with grooming, performing overhead activities, dressing, and particularly fastening items behind the back. Adhesive capsulitis is considered to be a self-limiting disease with sources stating symptom resolution as early as 6 months up to 11 years. Unfortunately symptoms may never fully subside in many patients. Acute/freezing/painful phase: gradual onset of shoulder pain at rest with sharp pain at extremes of motion, and pain at night with sleep interruption which may last anywhere from 3-9 months. Adhesive/frozen/stiffening phase: Pain starts to subside, progressive loss of glenohumeral motion in capsular pattern. Pain is apparent only at extremes of movement. This phase may occur at around 4 months and last til about 12 months. Resolution/thawing phase: Spontaneous, progressive improvement in functional range of motion which can last anywhere from 1 to 3.5 years. Osteoarthritis (OA). Both may have limited abduction and external rotation AROM but with OA, PROM will not be limited. OA will also present with the most limitations with flexion whereas this is the least affected motion with adhesive capsulitis. Radiography can be used to rule out pathology of osseous structures. Bursitis. Bursitis presents very similarly to adhesive capsulitis, especially compared to the early phases. Patients with bursitis will present with a non-traumatic onset of severe pain with most motions being painful. A main difference will be the amount of PROM achieved. Adhesive capsulitis will be extremely limited and painful whilst patients with bursitis, although painful, will have a larger PROM. Parsonage-Turner Syndrome (PTS). PTS occurs due to inflammation of the brachial plexus. Patients will present without a history of trauma and with painful restrictions of all motions. The pain with PTS usually subsides much quicker than with adhesive capsulitis and patients eventually display neurological problems (atrophy of muscles or weakness) that are seen several weeks after the initial onset of pain. Rotator Cuff (RC) Pathologies. The primary way to distinguish RC pathologies from adhesive capsulitis is to examine the specific ROM restrictions. Adhesive capsulitis presents with restrictions in the capsular pattern while RC involvement typically does not. RC tendinopathy may present similarly to the first stage of adhesive capsulitis because there is limited loss of external rotation and strength tests may be normal. MRI and ultrasonography can be used to identify soft tissue abnormalities of the soft tissue and labrum. Posterior Dislocation. A posteriorly dislocated shoulder can present with shoulder pain and limited ROM, but, unlike adhesive capsulitis, it is related to a specific traumatic event. If the patient is unable to fully supinate the arm while flexing the shoulder, the clinician should suspect a posterior dislocation. "Active Muscle Guarding" Hollmann et al. (2015) reported in their study that all of the patients suspected to have Frozen Shoulder showed a significant increase in range of motion under anesthesia, which confirms that some cases might have been falsely diagnosed with Frozen Shoulder and that the loss of range of motion cannot only explained by capsular contractions. Currently the diagnosis of primary adhesive capsulitis is based on the findings of the patient history and physical examination. The following outcome measures have been used in studies researching adhesive capsulitis. Roy et al examined the psychometric properties of the SPADI, DASH, ASES and SST were examined.Reliability, construct validity and responsiveness were all found to be favourable for various shoulder pathologies, but the review did not address their strength relative to adhesive capsulitis specifically. Scapular winging of the involved shoulder may be observed from the posterior and/or lateral views. A full UQE should be performed to rule out cervical spine involvement or any neurological pathologies. Cervical, thoracic, shoulder ROMs with OP as well as rib mobility should be performed. Scapular substitution frequently accompanies active shoulder motion. Shoulder external rotation (ER)/ Internal rotation (IR)/abduction (ABd) (seated) should be performed. Patients with adhesive capsulitis present with weakness in shoulder ER, IR and ABd relative to the asymptomatic side. The method of measuring ER and IR ROM in patients with suspected adhesive capsulitis varies in the literature. Patients with adhesive capsulitis commonly present with ROM restrictions in a capsular pattern. A capsular pattern is a proportional motion restriction unique to every joint that indicates irritation of the entire joint. The shoulder joint has a capsular pattern where external rotation is more limited than abduction which is more limited than internal rotation (ER limitations > ABD limitations > IR limitations). In the case of adhesive capsulitis, ER is significantly limited when compared to IR and ABD, while ABD and IR were not seen to be different. In patients with adhesive capsulitis, the anterior and inferior capsule will be the most limited but joint mobility will be restricted in all directions. These tests require appropriate elbow, scapulothoracic, and thoracic mobility and these areas should be cleared of pathology first. If a patient is unable to complete the motion, other structures outside of the shoulder joint may be the limiting factor. These functional measures appear to be helpful for their objectivity in measuring shoulder dysfunction. However, even though the tests mimic fundamental ADL movements, the direct relationship between these tests and activities of daily living cannot be assumed. No specific clinical test for adhesive capsulitis has been reported in the literature and there remains no gold standard to diagnose adhesive capsulitis. While there are no confirmed diagnostic criteria, a recent study determined a set of clinical identifiers that achieved a general consensus amongst experts for the early stages of primary (idiopathic) adhesive capsulitis. The following tools can be used to help determine the stage of adhesive capsulitis and/or its irritability status. Consensus was achieved on eight clinical identifiers collated into two discrete domains (pain and movement) as well as an age component. Although Adhesive Capsulitis is a self-limiting condition, it can take up to two to three years for symptoms to resolve and some patients may never fully regain full motion. Treatment for pain, loss of motion, and limited function rather than take the wait-and-see approach is therefore important. Various interventions have been researched that address the treatment of the synovitis and inflammation and modify the capsular contractions such as oral medications, corticosteroid injections, distension, manipulation, and surgery. Even though many of these treatments have shown significant benefits over no intervention at all, definitive management regimens remain unclear. It is suggested that the primary treatment for adhesive capsulitis should be based around physical therapy and anti-inflammatory measures, these outcomes, however, are not always superior to other interventions. Corticosteroid injections are often used to manage inflammation as it is understood that inflammation is a key factor in the early stages of the condition. The injections aim to reduce the painful synovitis occurring within the shoulder. This can limit the development of fibrosis and adhesions within the capsule, potentially shortening the natural history of the disease. Hence they are thought to be more useful in the early, painful and freezing stage of the condition due to the involvement of inflammation, rather than in the latter stages when fibrous contractures are more apparent. Methyl-prednisolone and Triamicinolone have both been found to be effective for injection use. There is no evidence suggesting the most effective treatment dose or administration site. The majority of the studies, however, used 20-40 mg injected via an anterior or posterior approach. Many studies have been performed and reviewed comparing corticosteroid injections to physical therapy, but results have been contradictory. It has been concluded that corticosteroid injections provide significantly greater short term benefits (4-6 weeks), especially in pain relief, but there is little to no difference in outcomes by 12 weeks compared to physical therapy. The majority of studies, however, investigating corticosteroid injection as a treatment option do not define what stage the patients are in and had variations in the volumes of corticosteroid used. It has been shown that the benefits may not only be dose dependent, but also dependent on the duration of symptoms as well. Therefore, the earlier the injection is received, the quicker the individual will recover. Contraindications to corticosteroids use include a history of infection, coagulopathy, or uncontrolled diabetes. Ultimately, corticosteroid injections have been shown to have success rates ranging from 44-80% with rapid pain relief and improved function occurring mainly in the first weeks of treatment. It is a first line treatment for patients with pain as their predominant complaint in the early stages of adhesive capsulitis. Though intra-articular steroid injection may be beneficial early on, its effect may be small and not well maintained and should be offered in conjunction with physical therapy. Injection for relieving shoulder disability and pain and physical therapy for improving motion in the painful freezing stage. If patients fail to progress within 3-6 weeks with physical therapy alone or patient's symptoms worsen, they should be offered the option of a corticosteroid injection. Manipulation under anesthesia involves a controlled and forced, end range positioning of the humerus relative to the glenoid in physiologic planes of motion (flexion, abduction, rotation) in patients with an anesthetic block to the brachial plexus. The block allows the shoulder muscles to completely relax so that the force may actually reach the capsuloligamentous structures.Traditionally, long lever arms were used, but now short lever arm techniques are utilised to minimise potential risks. Although success rates are high, ranging from 75-100%, manipulations are considered a last resort and are not indicated unless symptoms persist in spite of adequate conservative treatment for six months. This is due to the numerous risks and complications such as: dislocation, glenoid, scapular, or humeral fracture, nerve palsy, rotator cuff tear, hemarthrosis, labral tears, and traction injuries of the brachial plexus or a peripheral nerve. However, it has been shown that manipulations are the most reliable way to improve range of motion and reduce pain and disability in patients resistant to physical therapy and these complications can be minimised with proper techniques and precautions. A good prognosis is often indicated if an audible and palpable release of the tissue occurs during the manipulation. An extensive post-manipulation programme begins immediately after release of the capsule. They are often prescribed active assisted range of motion exercises that should be performed every two hours during waking hours, for the next 24 hours. Patients are also instructed to ice their shoulder for 20 minutes every two hours with their hand resting behind their head. Post manipulation programs are designed to maintain gains in shoulder mobility and should specifically address each individual's impairments. Contraindications to manipulation under anesthesia include: history of fracture or dislocations, moderate bone loss, or an inability to follow through with post procedure care. Although manipulation under anesthesia has been shown to be effective in improving function and motion in patients with adhesive capsulitis, more randomised controlled trials comparing this treatment to competing treatments before widespread use are needed. An alternative to traditional MUA is translation mobilisation under anesthesia, which has been identified in an attempt to avoid the complications associated with the traditional approach. This procedure involves the use of gliding techniques with static end range capsular stress with a short amplitude high velocity thrust, if needed, as opposed to the angular stretching forces in manipulation under anesthesia.2 to 3 30 second sets of low velocity, oscillatory mobilisations (Maitland Grade IV-IV+) are performed initially in the same directions as traditional manipulation under anesthesia (anteriorly, posteriorly, and inferiorly). If an immediate increase in passive range of motion is not seen, a high velocity, low amplitude manipulation may be performed. This technique appears to be a safe and efficacious alternative for treatment of patients resistant to conservative treatment, however, higher level studies are needed for verification. If a patient has persistent symptoms, particularly in decreased shoulder motion, after at least 6 months of conservative treatment, manipulation under anesthesia is an effective technique to improve mobility, pain and disability. Contraindications and complications do exist and should be relayed to the patient. Arthroscopic capsular release is the preferred method over open release in patients with painful, disabling adhesive capsulitis that is unresponsive to at least 6 months of non-operative treatment. It has been found to be a reliable and effective method for restoring range of motion and is especially recommended for diabetics and in post-operative or post-fracture adhesive capsulitis patients. It has become the most popular method of treating non-responsive adhesive capsulitis despite the lack of higher level trials comparing it to MUA. This is because it allows a more controlled and selective release of the contracted capsule compared to manipulation which ruptures the capsuloligamentous structures and avoids the complications associated with MUA. Debate exists over which structures should be arthroscopically released with the rotator cuff and coracohumeral ligament being the most common structures released. If patient is unresponsive to at least 6 months of conservative treatment, arthroscopic capsular release alone or in conjunction with manipulation has been shown to be effective in restoring range of motion. Avoids complications associated with manipulation under anesthesia and is recommended in diabetics and post-operative or post-fracture adhesive capsulitis patients. Non-steroidal anti-inflammatory drugs (NSAIDs) have traditionally been given to patients with adhesive capsulitis, but there is no high level evidence that confirms their effectiveness. Oral steroids have also been utilised in these patients and result in some improvement in function, but their effects have not shown long term benefits and combined with their known adverse side effects, should not be regarded as a routine treatment. Another technique that shows some short term benefit with rapid relief of symptoms is distension arthrography. This technique involves the injection of a solution (saline alone or combined with corticosteroids) causing rupture of the capsule by hydrostatic pressure. It is still undetermined whether joint distension with saline solution combined with corticosteroids provides more benefit than distension with saline alone or corticosteroid injection alone. There is a lack of reliable evidence when determining the effectiveness of this technique and further research needs to be performed to verify any clinical benefit. Suprascapular nerve blocks are thought to temporarily disrupt pain signals to allow normalisation of the pathological, neurological processes perpetuating pain and disability. There is some evidence of benefit with suprascapular nerve blocks, though the exact mechanism behind this benefit remains unclear and higher level evidence is needed to establish this as a treatment for adhesive capsulitis. According to a Cochrane review by Green et al, there is little evidence to support or refute the use of any of the common interventions listed for adhesive capsulitis. There are also no studies with objective data supporting the timing of when to switch to invasive treatments such as manipulation under anesthesia or arthroscopic release which are not usually performed until 6 months of conservative treatment have been unsuccessful. Unfortunately this exposes more than 40% of patients with adhesive capsulitis to a long period of disability. Treatment should be tailored to the stage of the disease because the condition has a predictable progression. During the painful freezing stage, treatment should be directed at pain relief with pain guiding activity. NSAIDs, physical therapy and steroid injection are all suggested interventions during this stage of adhesive capsulitis. Once the patient is in the adhesive stage, injections are no longer indicated because the inflammatory stage of the disease has passed. The focus should instead switch to more aggressive stretching and MUA or surgical release if symptoms are unresponsive to conservative treatment and quality of life is compromised. As alluded to, treatment should be customised to each individual based on the stage of the condition. Blanchard V, Barr S, Cerisola FL, 2010, The effectiveness of corticosteroid injections compared with physiotherapeutic interventions for adhesive capsulitis: a systematic review, Physiotherapy. 2010 Jun;96(2):95-107. 0 The fingers reach the posterior median line of the neck with the shoulder in full abduction and external rotation without wrist extension. 1 The fingers reach the median line of the neck but do not have full abduction and/or external rotation. * This test measures an action essential for daily activities, such as using the arm to reach, pull, or hang an object overhead or using the arm to pick up and drink a cup of water. ¤ This test measures an action essential for daily activities, such as using the arm to pull an object out of a back pocket or tasks related to personal care. § This test measures an action important for daily activities, such as using the arm to reach across the body to get a car's seat belt or using the arm to turn a steering wheel. 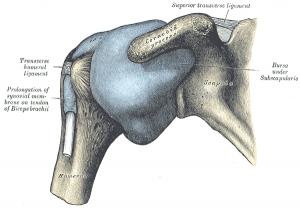 There is no definitive treatment for adhesive capsulitis. However, the literature suggests interventions should be tailored to the stage of the disease based on its progressive nature. During the initial/painful freezing stage, treatment should be directed at pain relief with pain guiding activity. NSAIDs and steroid injection, stretching, strengthening and range of motion exercises, as well as Maitland Grade I-II mobilisations have been shown to improve function and reduce pain and disability. As the patient progresses to the adhesive stage, intervention should focus on aggressive, end-range stretches combined with Maitland Grade III-IV mobilisations. At six months, if functional disability persists despite conservative treatment, mobilisations under anaesthesia (MUA) or arthroscopic capsular release may be indicated. ↑ Bussieres AE, Peterson C, Taylor JA. Diagnostic imaging guideline for musculoskeletal complaints in adults - an evidence based approach: Part 2 - upper extremity disorders. J Manipulative Physiol Ther 2008;31:2-32. ↑ 7.0 7.1 7.2 7.3 7.4 7.5 7.6 Walmsley S, Rivett DA, Osmotherly PG. Adhesive capsulitis: Establishing consensus on clinical identifiers for stage 1 using the delphi technique. Phys Ther 2009;89:906-917. ↑ 9.0 9.1 9.2 9.3 9.4 9.5 9.6 Boyles RE, Flynn TW, Whitman JM. Manipulation following regional intrascalene anesthetic block for shoulder adhesive capsulitis: A case series. Man Ther 2005:10;164-171. ↑ 13.0 13.1 13.2 Kline CM. Adhesive capsulitis: clues and complexities. JAMA Online 2007;2-9. ↑ 14.0 14.1 14.2 14.3 14.4 14.5 14.6 14.7 14.8 Blanchard V, Barr S, Cerisola FL. The effectivemess of corticosteroid injections compared with physiotherapeutic interventions for adhesive capsulitits: A systematic review. Physiotherapy 2010; 96: 95-107. ↑ Hollmann L, Halaki M, Haber M, Herbert R, Dalton S, Ginn K. Determining the contribution of active stiffness to reduced range of motion in frozen shoulder. Physiotherapy 2015;101:e585. ↑ Roy J, MacDermid J, Woodhouse L. Measuring shoulder function: A systematic review of four questionnaires. Arthritis Rheum 2009;61(5):623-632. ↑ 21.0 21.1 21.2 21.3 Mitsh J, Casey J, McKinnis R, Kegerreis S, Stikeleather J. Investigation of a consistent pattern of motion restriction in patients with adhesive capsulitis. J Man Manip Ther 2004;12:153-159. ↑ 23.0 23.1 Millar AL, Jasheway PA, Eaton W, Christensen F. A retrospective, descriptive study of shoulder outcomes in outpatient physical therapy. J Orthop Sports Phys Ther 2006;36:403-414. ↑ 25.0 25.1 Yang J, Lin J. Reliability of function-related tests in patients with shoulder pathologies. J Orthop Sports Phys Ther 2006;36:572-576. ↑ Page MJ, Green S, Kramer S, Johnston RV, McBain B, Chau M, Buchbinder R. Manual therapy and exercise for adhesive capsulitis (frozen shoulder). Cochrane Database of Systematic Reviews. 2014(8). ↑ 28.00 28.01 28.02 28.03 28.04 28.05 28.06 28.07 28.08 28.09 28.10 Neviaser AS, Hannafin JA. Adhesive Capsulitis: A Review of Current Treatment. The Am J Sports Med 2010;38:2346-56. ↑ 29.0 29.1 Buchbinder R, Green S, Youd JM. Corticosteroid injections for shoulder pain. Cochrane Database Syst Rev 2009;1:CD004016. ↑ Buchbinder R, Green S, Youd JM, Johnston RV. Oral steroids for adhesive capsulitis. Cochrane Database Syst Rev 2009;1:CD006189. ↑ Buchbinder R, Green S, Youd JM, Johnston RV, Cumpston M. Arthrographic distension for adhesive capsulitis (frozen shoulder). Cochrane Database Syst Rev 2009;1:CD007005.